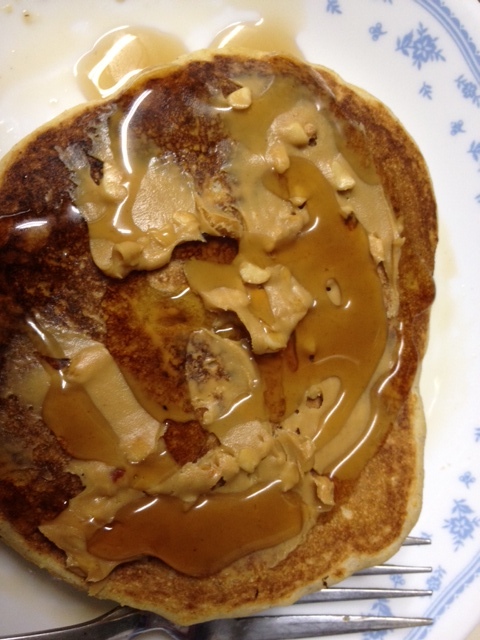 This morning when I got up, I went for a long run and was just craving something carb-y when I got home. 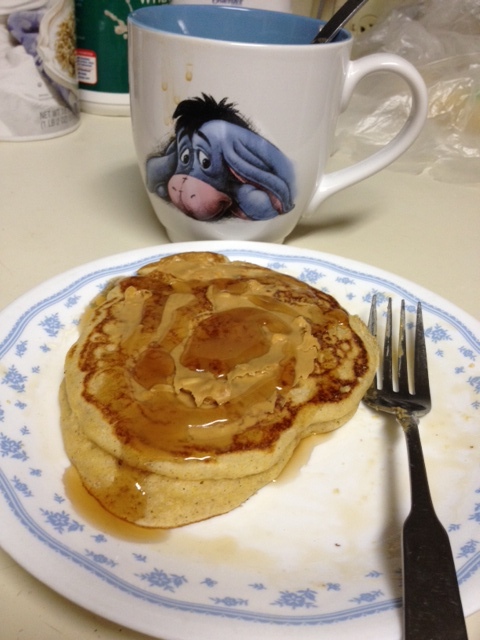 Though I normally don’t do much besides coffee for weekend breakfasts, I decided to whip up some pancakes. 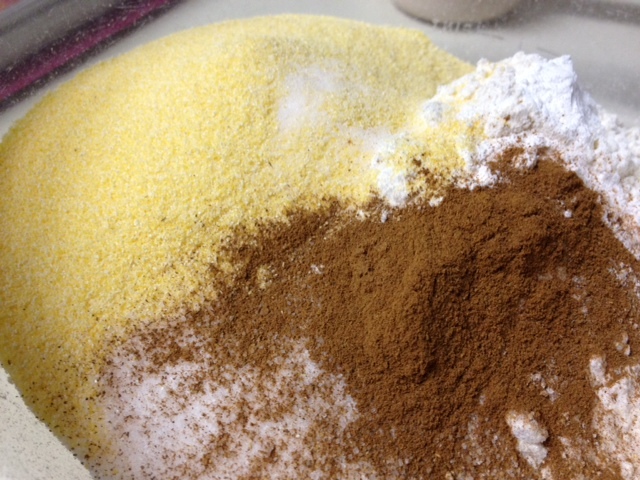 I’d found this recipe in a Food & Wine issue (I think) a long time ago and was intrigued by the cornmeal and cinnamon combination. I tried it once on a whim and was hooked. I probably make them more than regular pancakes now. What’s even better? The recipe is super easy, takes the same amount of time as regular pancakes, and you should already have all the ingredients on hand. Combine all the dry ingredients, making sure to stir well. 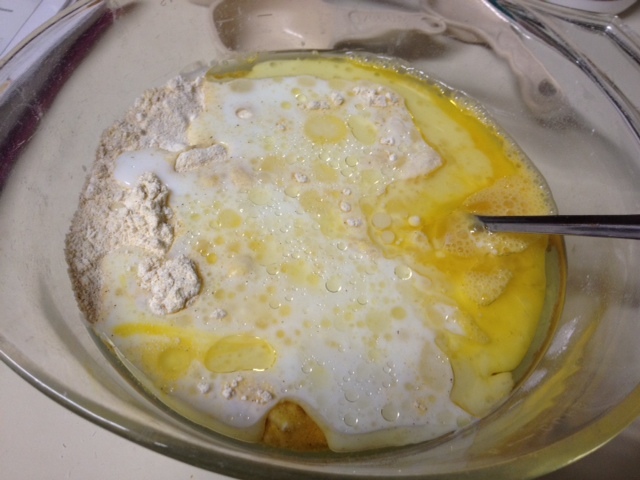 Beat the eggs in a bowl, add to the dry ingredients (don’t stir yet). 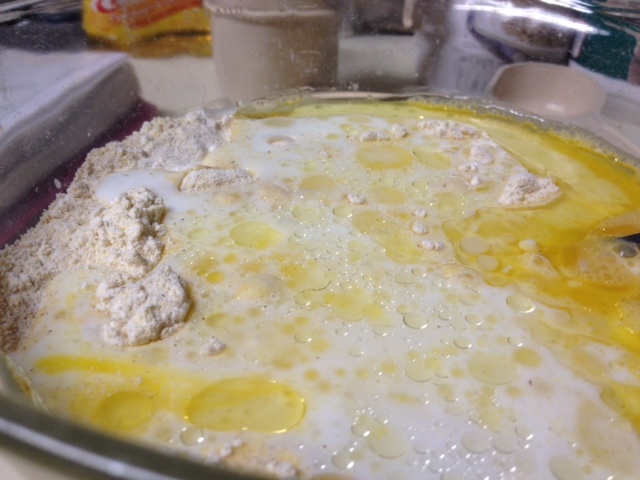 Add the buttermilk and oil as well, stir just enough to get everything wet. You can leave small lumps. It should be about this consistency, not too runny. 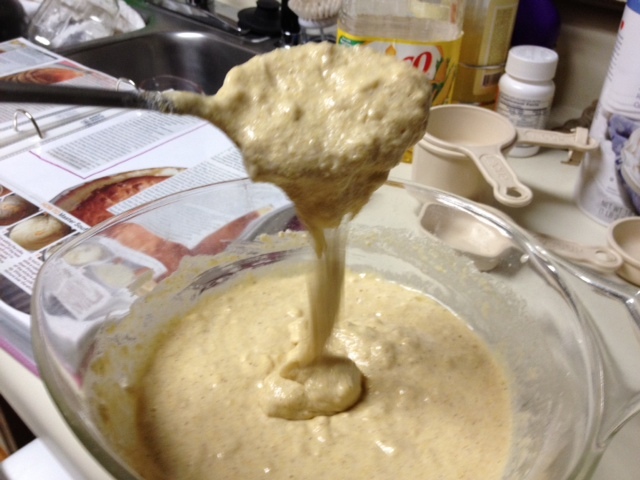 I love the grainy consistency of the batter. Heat a skillet on medium-high, spray lightly with oil. 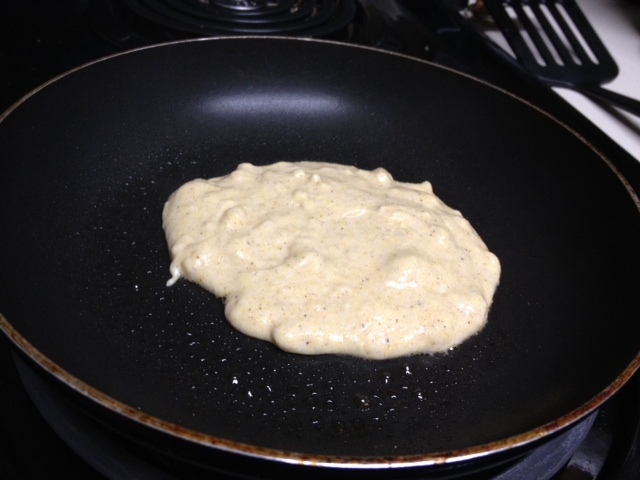 Ladle batter into the skillet, wait to flip until it’s lightly browned and bubbles begin coming to the surface. Flip, cook another minute until browned on both sides. 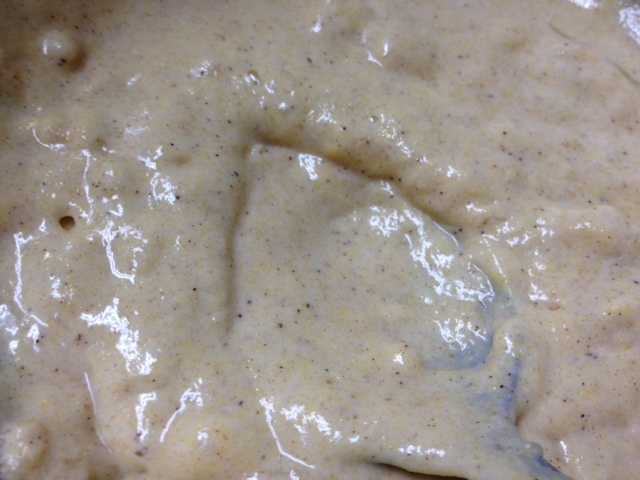 They’re great with peanut butter and syrup (goes well with the cinnamon), butter and syrup, or fruit compote. 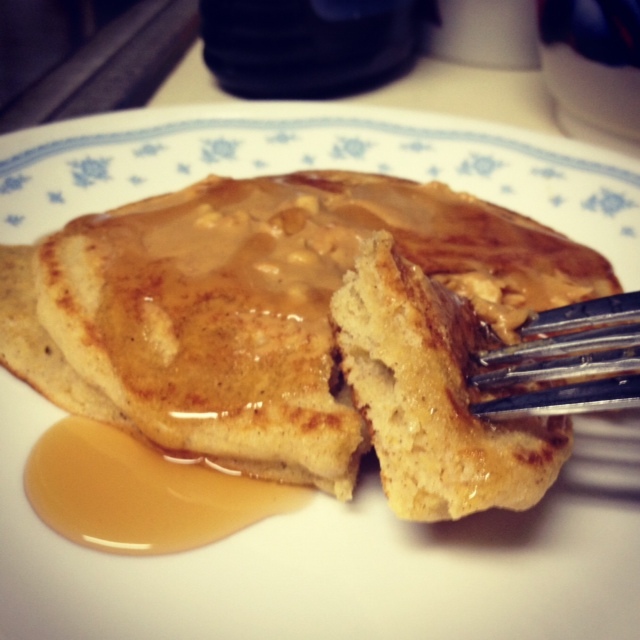 Super easy, doesn’t take any more time than regular pancakes. Set a griddle or skillet over moderate high heat and spray it with vegetable oil spray. 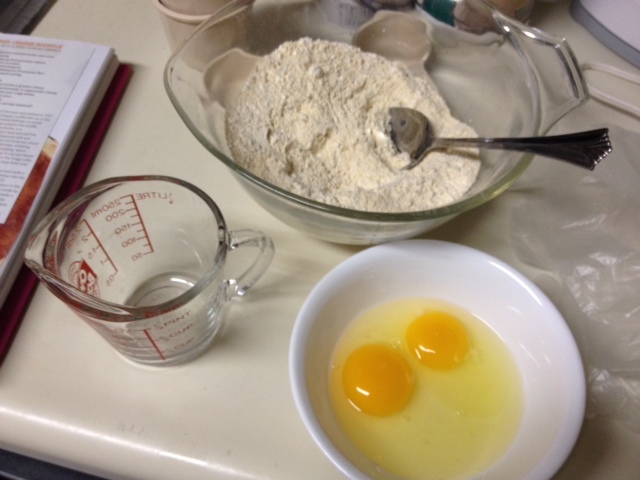 When the pan is hot, spoon in 1/4 mounds of batter (I don’t measure it) and spread to form 4-inch rounds. 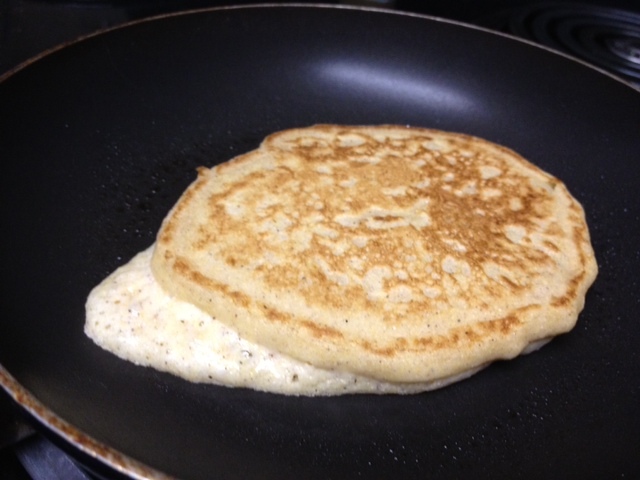 Cook the pancakes until the bottoms are browned and bubbles appear on the surface. Flip and cook until browned on the bottom. Serve the pancakes warm. It recommends serving with berry compote (which sounds awesome), but it’s also awesome with peanut butter or butter and syrup.